Distinguishing invasive disease from noninvasive disease is important because the treatment and prognosis are different for each. Noninvasive disease has 2 varieties of presentations, and invasive disease has 3 varieties of presentations. This article reviews all 5 varieties. For patient education information, see the Headache and Migraine Center. Also, visit the patient education article Sinus Infection. 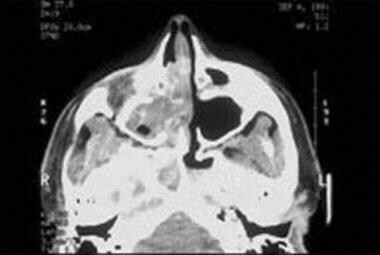 Axial CT scan of sinuses shows a right fungal maxillary sinusitis with an expanding mass (possibly aspergillosis). Fungal infections of the paranasal sinuses are uncommon and usually occur in individuals who are immunocompromised. However, recently, the occurrence of fungal sinusitis has increased in the immunocompetent population. The most common pathogens are from Aspergillus and Mucor species. Aspergillosis can cause noninvasive or invasive infections. Invasive infections are characterized by dark, thick, greasy material found in the sinuses. Invasive infections can cause tissue invasion and destruction of adjacent structures (eg, orbit, CNS). Noninvasive infections cause symptoms of sinusitis, and the sinus involved is opacified on radiographic studies. Routine cultures from the sinuses rarely demonstrate the fungus. However, the fungus is usually suspected upon reviewing the CT scan result and is detected on removal of the secretions from the sinus. Fungal infections of the paranasal sinus can manifest as 2 distinct entities. The more serious infection commonly occurs in patients with diabetes or in individuals who are immunocompromised and is characterized by its invasiveness, tissue destruction, and rapid onset. Early detection and treatment are vital for these infections because of the high mortality rate. Noninvasive infections are chronic and are usually treated for extended periods as chronic sinusitis before the condition is recognized. Two forms are described in this category: allergic fungal sinusitis and sinus mycetoma/ball. Most commonly, Curvularia lunata,Aspergillus fumigatus, and Bipolaris and Drechslera species cause allergic fungal sinusitis. A fumigatus and dematiaceous fungi most commonly cause sinus mycetoma. Invasive fungal sinusitis includes the acute fulminant type, which has a high mortality rate if not recognized early and treated aggressively, and the chronic and granulomatous types. Saprophytic fungi of the order Mucorales, including Rhizopus,Rhizomucor,Absidia,Mucor,Cunninghamella,Mortierella,Saksenaea, and Apophysomyces species, cause acute invasive fungal sinusitis. A fumigatus is the only fungus associated with chronic invasive fungal sinusitis. Aspergillus flavus exclusively has been associated with granulomatous invasive fungal sinusitis. Surgery reveals greenish black or brown material (ie, allergic mucin), which has the consistency of peanut butter mixed with sand and glue. Allergic mucin and polyps may form a partially calcified expansile mass that obstructs sinus drainage. Growth of the mass may cause pressure-induced erosion of bone, rupture of sinus walls, and occasional leakage of the sinus contents into the orbit or brain. This condition is usually unilateral and involves the maxillary sinus. Mucopurulent, cheesy, or claylike material is present at the time of surgery. Patients with sinusitis mycetoma are immunocompetent. Allergic conditions and fungus-specific IgE are less common. Acute invasive fungal sinusitis results from a rapid spread of fungi through vascular invasion into the orbit and CNS. It is common in patients with diabetes and in patients who are immunocompromised and has been reported in immunocompetent individuals. Typically, patients with acute invasive sinusitis are severely ill with fever, cough, nasal discharge, headache, and mental status changes. They usually require hospitalization. Chronic invasive fungal sinusitis is a slowly progressive fungal infection with a low-grade invasive process and usually occurs in patients with diabetes. Orbital apex syndrome, which is characterized by a decrease in vision and ocular immobility due to a mass in the superior portion of the orbit, is usually associated with this condition. This condition has been reported almost exclusively in immunocompetent individuals from North Africa. Generally, proptosis is associated with granulomatous invasive fungal sinusitis. Patients present with symptoms of chronic sinusitis, which may include facial pressure, headache, nasal stuffiness, discharge, and cough. The condition should be suspected in individuals with intractable sinusitis and nasal polyposis. Some patients may present with proptosis or eye muscle entrapment. These patients usually have atopy and have had multiple surgeries by the time of diagnosis. CT scanning of the sinuses reveals opacification with concretions and/or calcifications. Presentation of patients with sinus mycetoma is similar to that of patients with sinusitis. Examination may reveal polyposis with evidence of sinusitis, mainly on one side. The main report is blowing of gravel-like material from the nose. Usually, sinus mycetoma is found accidentally on CT scanning of the sinuses. Patients are usually hospitalized and are very sick with fever, cough, nasal discharge, headache, and mental status changes. A high index of suspicion for early diagnosis is critical, especially in individuals who are immunocompromised. Signs and symptoms include dark ulcers on the septum, turbinates, or palate. In the late stages, signs and symptoms of cavernous sinus thrombosis are present. Patients present with symptoms of long-standing sinusitis. Symptoms are usually not acute, and fever and mental status changes are absent. Nasal examination findings can be minimal. However, findings from the eye examination can be positive. Patients present with symptoms of chronic sinusitis associated with proptosis. Examination of the nasal cavity can be nonrevealing. However, findings from the eye examination are usually impressive. The treatment of choice for all types of fungal sinusitis is surgical (see Surgical therapy). All forms of fungal sinusitis require surgical treatment. The only contraindications to surgical management relate to the general condition of the patient. Before surgery is recommended, risks and benefits of the surgical procedure should be weighed against the risks of general anesthesia. Hussain S, Salahuddin N, Ahmad I, Salahuddin I, Jooma R. Rhinocerebral invasive mycosis: occurrence in immunocompetent individuals. Eur J Radiol. 1995 Jul. 20(2):151-5. [Medline]. Scharf JL, Soliman AM. Chronic rhizopus invasive fungal rhinosinusitis in an immunocompetent host. Laryngoscope. 2004 Sep. 114(9):1533-5. [Medline]. Siddiqui AA, Shah AA, Bashir SH. Craniocerebral aspergillosis of sinonasal origin in immunocompetent patients: clinical spectrum and outcome in 25 cases. Neurosurgery. 2004 Sep. 55(3):602-11; discussion 611-3. [Medline]. Lu-Myers Y, Deal AM, Miller JD, et al. Comparison of Socioeconomic and Demographic Factors in Patients with Chronic Rhinosinusitis and Allergic Fungal Rhinosinusitis. Otolaryngol Head Neck Surg. 2015 Apr 27. [Medline]. Pant H, Schembri MA, Wormald PJ, Macardle PJ. IgE-mediated fungal allergy in allergic fungal sinusitis. Laryngoscope. 2009 Apr 8. [Medline]. Gupta R, Gupta AK, Patro SK, et al. Allergic fungal rhino sinusitis with granulomas: A new entity?. Med Mycol. 2015 May 30. [Medline]. Lieberman SM, Jacobs JB, Lebowitz RA, Fitzgerald MB, Crawford J, Feigenbaum BA. Measurement of Mycotoxins in Patients with Chronic Rhinosinusitis. Otolaryngol Head Neck Surg. 2011 Mar 31. [Medline]. Payne SJ, Mitzner R, Kunchala S, Roland L, McGinn JD. Acute Invasive Fungal Rhinosinusitis: A 15-Year Experience with 41 Patients. Otolaryngol Head Neck Surg. 2016 Apr. 154 (4):759-64. [Medline]. Gamba JL, Woodruff WW, Djang WT, Yeates AE. Craniofacial mucormycosis: assessment with CT. Radiology. 1986 Jul. 160(1):207-12. [Medline]. Manning SC, Merkel M, Kriesel K, Vuitch F, Marple B. Computed tomography and magnetic resonance diagnosis of allergic fungal sinusitis. Laryngoscope. 1997 Feb. 107(2):170-6. [Medline]. Middlebrooks EH, Frost CJ, De Jesus RO, Massini TC, Schmalfuss IM, Mancuso AA. Acute Invasive Fungal Rhinosinusitis: A Comprehensive Update of CT Findings and Design of an Effective Diagnostic Imaging Model. AJNR Am J Neuroradiol. 2015 Apr 16. [Medline]. Mehta R, Panda NK, Mohindra S, et al. Comparison of efficacy of amphotericin B and itraconazole in chronic invasive fungal sinusitis. Indian J Otolaryngol Head Neck Surg. 2013 Aug. 65:288-94. [Medline]. [Full Text]. Masterson L, Egro FM, Bewick J, et al. Quality-of-life outcomes after sinus surgery in allergic fungal rhinosinusitis versus nonfungal chronic rhinosinusitis. Am J Rhinol Allergy. 2016 Mar-Apr. 30 (2):e30-5. [Medline]. Green KK, Barham HP, Allen GC, Chan KH. Prognostic Factors in the Outcome of Invasive Fungal Sinusitis in a Pediatric Population. Pediatr Infect Dis J. 2016 Apr. 35 (4):384-6. [Medline]. Smith A, Thimmappa V, Shepherd B, Ray M, Sheyn A, Thompson J. Invasive fungal sinusitis in the pediatric population: Systematic review with quantitative synthesis of the literature. Int J Pediatr Otorhinolaryngol. 2016 Nov. 90:231-5. [Medline]. Wallace DV, Dykewicz MS, Bernstein DI, et al. The diagnosis and management of rhinitis: an updated practice parameter. J Allergy Clin Immunol. 2008 Aug. 122(2 Suppl):S1-84. [Medline]. Anselmo-Lima WT, Lopes RP, Valera FC, Demarco RC. Invasive fungal rhinosinusitis in immunocompromised patients. Rhinology. 2004 Sep. 42(3):141-4. [Medline]. Gosepath J, Mann WJ. Role of fungus in eosinophilic sinusitis. Curr Opin Otolaryngol Head Neck Surg. 2005 Feb. 13(1):9-13. [Medline]. Sasama J, Sherris DA, Shin SH, Kephart GM, Kern EB, Ponikau JU. New paradigm for the roles of fungi and eosinophils in chronic rhinosinusitis. Curr Opin Otolaryngol Head Neck Surg. 2005 Feb. 13(1):2-8. [Medline]. Schubert MS, Hutcheson PS, Graff RJ, Santiago L, Slavin RG. HLA-DQB1 *03 in allergic fungal sinusitis and other chronic hypertrophic rhinosinusitis disorders. J Allergy Clin Immunol. 2004 Dec. 114(6):1376-83. [Medline]. Shin SH, Ponikau JU, Sherris DA, et al. Chronic rhinosinusitis: an enhanced immune response to ubiquitous airborne fungi. J Allergy Clin Immunol. 2004 Dec. 114(6):1369-75. [Medline]. Sohail MA, Al Khabori MJ, Hyder J, Verma A. Allergic fungal sinusitis: can we predict the recurrence?. Otolaryngol Head Neck Surg. 2004 Nov. 131(5):704-10. [Medline]. Wise SK, Venkatraman G, Wise JC, DelGaudio JM. Ethnic and gender differences in bone erosion in allergic fungal sinusitis. Am J Rhinol. 2004 Nov-Dec. 18(6):397-404. [Medline]. Melancon CC, Clinger JD. The Use of Frozen Section in the Early Diagnosis of Acute Invasive Fungal Sinusitis. Otolaryngol Head Neck Surg. 2017 Aug. 157 (2):314-9. [Medline]. Paknezhad H, Borchard NA, Charville GW, et al. Evidence for a 'preinvasive' variant of fungal sinusitis: tissue invasion without angioinvasion. World J Otorhinolaryngol Head Neck Surg. 2017 Mar. 3 (1):37-43. [Medline]. [Full Text].